9 excursions were organised in 2017, the majority to proposed Local Biodiversity Sites (pLBS). 52 different individuals attended the outings, collectively contributing 87 volunteer days to TWIC. In total, 2,506 species records of 22 different taxonomic groups were submitted to TWIC from the excursions. Thank you to everyone who attended, especially the following who led outings for TWIC in 2017: Gary Hovell (LARG), Leonie Alexander (RBGE), Sarah Eno, Michael Scott, Jay MacKinnon, David Dodds and Reuben Singleton. 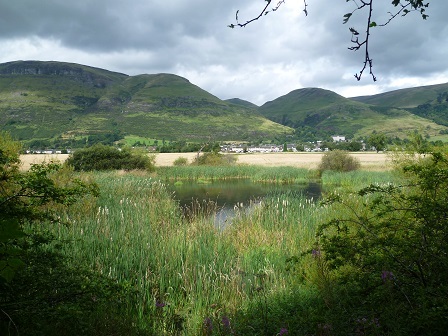 Thanks also to the landowners and land managers who gave us permission to access their sites. Amphibians, birds, butterflies, dragonflies (Odonata), hymenoptera, molluscs and terrestrial mammals. 3 species of amphibian breeding at ponds - Common Toad, Common Frog and Palmate Newt. The large shoal of Common Toad tadpoles observed at the Hurley Pond during the torchlight survey was an impressive sight. We were also surprised to find a newt eft in the ornamental pond in the walled garden. 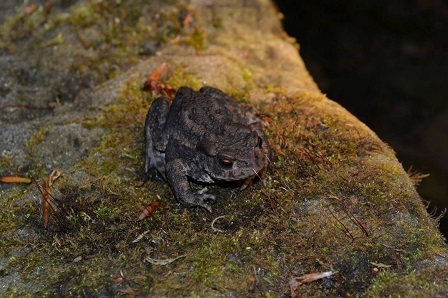 Common Toad (Bufo bufo) at Penicuik Estate. Photograph courtesy of LARG. 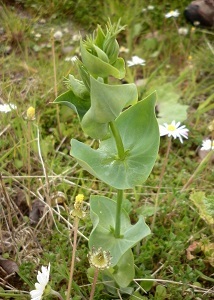 Yellow-wort (Blackstonia perfoliata). Photograph courtesy of Jackie Stewart from an East Lothian site. 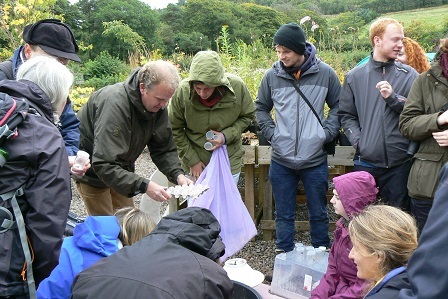 This was a joint meeting with Royal Botanic Garden Edinburgh (RBGE). Vascular plants, birds, bryophytes, hymenoptera, butterflies, mammals and a few other invertebrates. Highlights included the vascular plants Yellow-wort (Blackstonia perfoliata), Marsh Valerian (Valeriana dioica), Fern-grass (Catapodium rigidum) and Wood Small-reed (Calamagrostis epigejos) and the bryophyte, Variable Crisp-moss (Trichostomum brachydontium). Vascular plants, hymenoptera and mammals plus a few insects and an amphibian. Wilson's Filmy-fern (Hymenophyllum wilsonii), Hairy Stonecrop (Sedum villosum - pictured), Starry Saxifrage (Saxifraga stellaris), Broad-leaved Cotton grass (Eriophorum latifolium), Lesser Clubmoss (Selaginella selaginoides) and Dioecious Sedge (Carex dioica). Hairy Stonecrop (Sedum villosum). Photograph courtesy of Stuart Maxwell. A plant gall (Aceria cephalonea) on Sycamore. Photograph courtesy of Graeme Wilson. 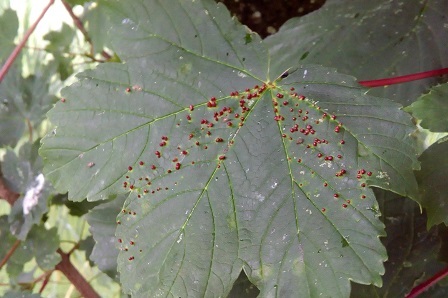 Vascular plants, birds, plant galls and a few insects. Bladder-sedge (Carex vesicaria) and Lesser Pond-sedge (Carex acutiformis). Several common orchids, including Common Twayblade (Neottia ovata), Broad-leaved Helleborine(Epipactis helleborine) and Northern Marsh-orchid (Dactylorhiza purpurella). Sadly, the Longworth trapping in Hermitage Wood failed to catch any small mammals on this occasion. The blanket growth of the invasive non-native species Water Fern (Azolla filiculoides) on the loch was an unwelcome sight. The plant can completely cover water bodies cutting out the light to the aquatic plants beneath, killing them and reducing the oxygen content of the water. The dense matt of vegetation can also be a safety hazard if small children or pets mistake it for solid ground. The university have tried to contain the plant with floating barriers. Vascular plants, molluscs, birds, butterflies, hymenoptera, dragonflies, crustaceans, amphibians, mammal and a few other insect groups. Cowbane (Cicuta virosa) was fairly abundant in the swamp. This plant is a local rarity in the Scottish Borders. 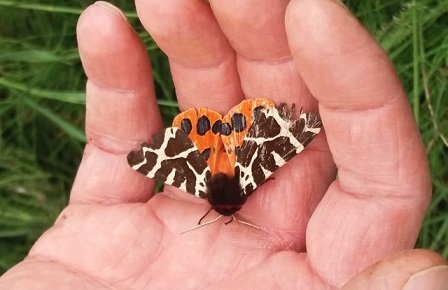 Garden Tiger Moth (Arctia caja). Photograph courtesy of Sarah Eno. Vascular plants, bryophytes, birds, hymenoptera, fungi, molluscs, butterflies, flies and a few other insect groups. 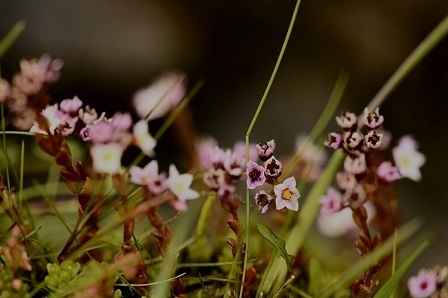 A total of 227 vascular plants and 62 bryophytes were recorded on site. The most interesting finds were the local rarities Unbranched Bur-reed (Sparganium emersum), Hybrid Campion (Silene latifolia x dioica), Hybrid Woundwort (Stachys sylvatica x palustris), Bay Willow (Salix pentandra) and Great Bindweed (Calystegia sepium subsp. sepium). Vascular plants, bryophytes, fungi, birds, butterflies, beetles, dragonflies, hymenoptera, and a few amphibians, flies, mammals and lichens. Botanical highlights were Nodding Bur-marigold (Bidens cernua, pictured), White Beak-sedge (Rhynchospora alba, pictured), Cranberry (Vaccinium oxycoccos) and Crowberry (Empetrum nigrum subsp. nigrum). Nodding Bur-marigold (Bidens cernua) and White Beak-sedge (Rhynchospora alba). Photos: Stuart Maxwell. Vascular plants, birds, butterflies, hymenoptera, plus a few bryophytes, fungi, amphibians and molluscs. Large-flowered Hemp-nettle (Galeopsis speciosa), Water-plantain (Alisma plantago-aquatica), Water-pepper (Persicaria hydropiper), Marsh Yellow-cress (Rorippa palustris) and Hybrid Campion (Silene latifolia x dioica). A Tawny Owl was also a nice spot. The lowlight was the presence of Indian Balsam (Impatiens glandulifera) in abundance along the riverside. This plant was also starting to invade the marsh. Vascular plants, moths, bryophytes, hoverflies, butterflies, hymenoptera, spiders, beetles, bugs, amphibians, and a few birds and other insect groups. 27 moth species recorded from the moth traps including the Borders local rarity Haworth's Minor (Celaena haworthii). 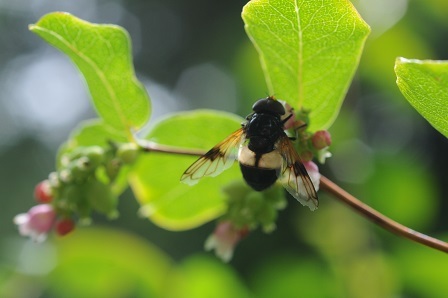 The flowers in the garden nursery attracted many butterflies, bees and flies. Reuben unveiling the previous night's moth haul. Photograph courtesy of Natalie Harmsworth.